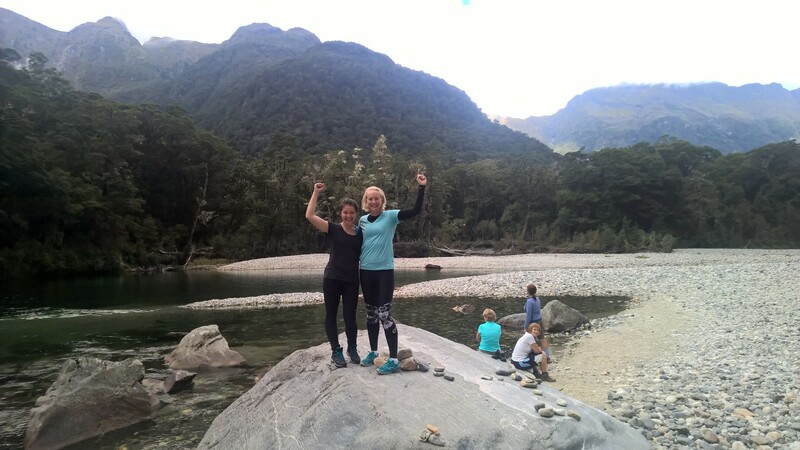 I’m not sure what I wast thinking when I organised my New Zealand trip all those many months ago, but apparently I thought all I needed were 2 days rest after the marathon before my legs would be recovered enough to walk the Milford Track Unguided. I was wrong. And what is Tramping I hear you say? 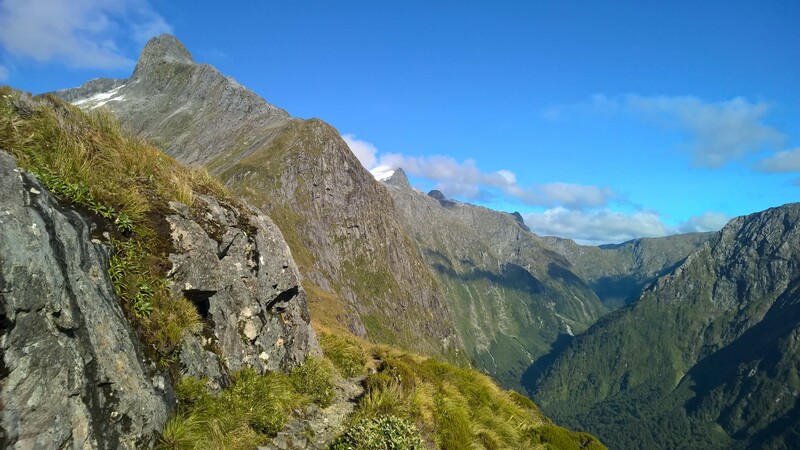 It’s the New Zealand word for trekking. 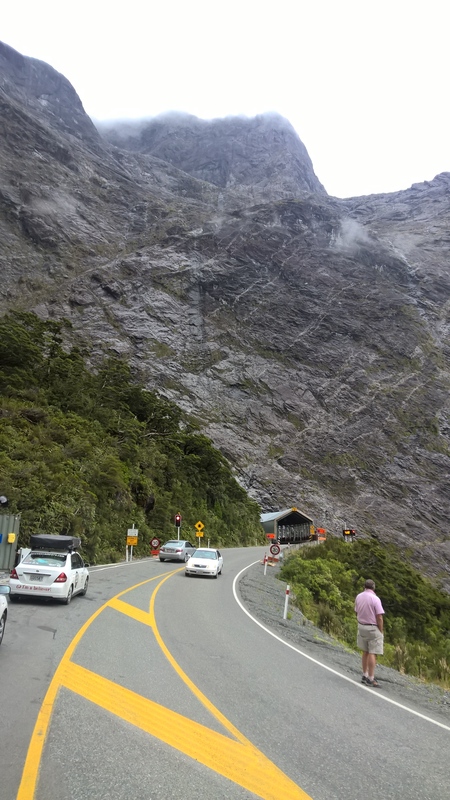 I was feeling a little nervous about doing this trip solo, but the company I booked with assured me that the track was very well signposted and i would be very safe. So I tried to remove the negative thoughts from my mind and started to get really excited about the adventure ahead. 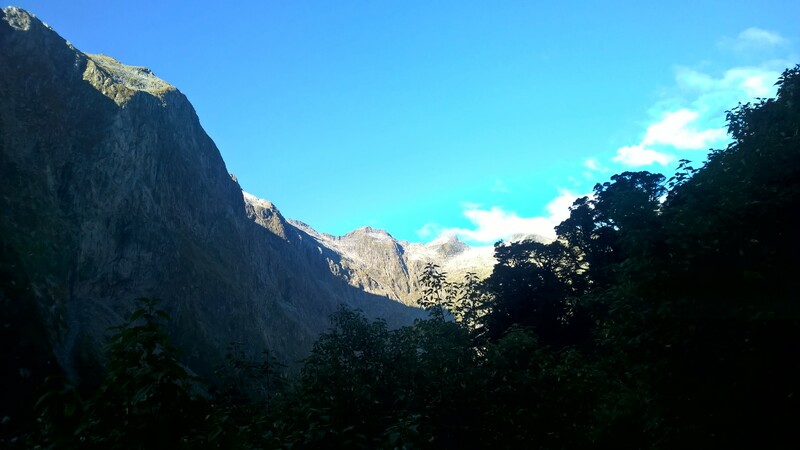 It had been a dream of mine for a long time to walk the Milford Track and now I was finally on my way!! The bus went past Frankton and Fairlight where the old steam train used to travel, and the drive gave us great commentary on the local area and it’s history. It was very cloudy the whole way, but we didn’t get any more rain. It was mesmerizing to look out the window and see the ever changing landscape that surrounded us. The 2 hour journey went relatively quickly and i was dropped off in Te Anau Terminal where I had second breakfast of bacon, eggs, mushrooms, hash brown and a real coffee. It would be a while before I got to have food like this again so I made the most of it. I finished up my breakfast and wandered around the tourist shop although i did not want to buy anything or it meant I had to carry it for the next week! 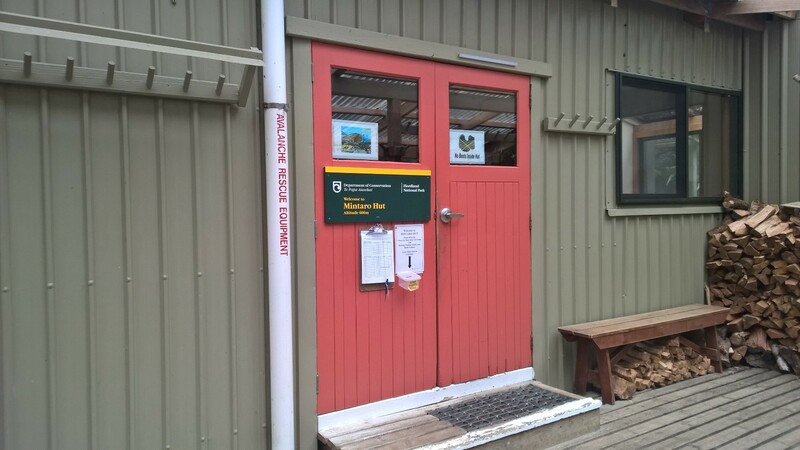 Once I had wasted some time at the Terminal I began my slow walk to the Department of Conservation (DOC) Hut where I had to collect my Hut tickets and meet my next bus for the trip to Te Anau Downs. It took me about 15-20 minutes to walk there, a beautiful walk beside the lake, and i stopped to watch sea planes and boats going about their day. 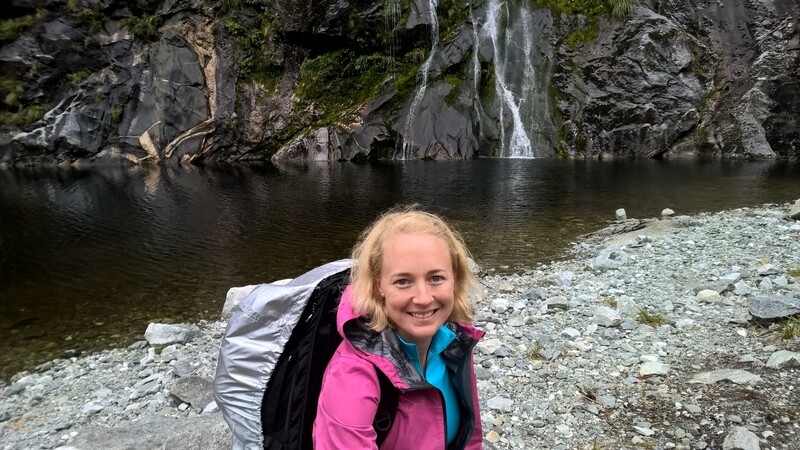 My pack felt awfully heavy and i wondered if there was anything that I could part with permanently, but unfortunately there was not so I just had to grin and bear it. I arrived at the DOC and the lady behind the counter was very helpful, she also recommended I buy their $9 heavy-duty water-proof plastic bag to put inside my pack to protect my sleeping bags and clothing, and after having heard that the Milford gets 300 days of rainfall per year I decided to take her up on that offer. There would be nothing worse than getting a wet sleeping bag or having no dry clothes! I wandered around the lake and took a few photos, visited the ladies room and then sat down to re-pack my bag with the new heavy-duty plastic lining bag. When I finished that I had a snack and caught up with writing this journal. 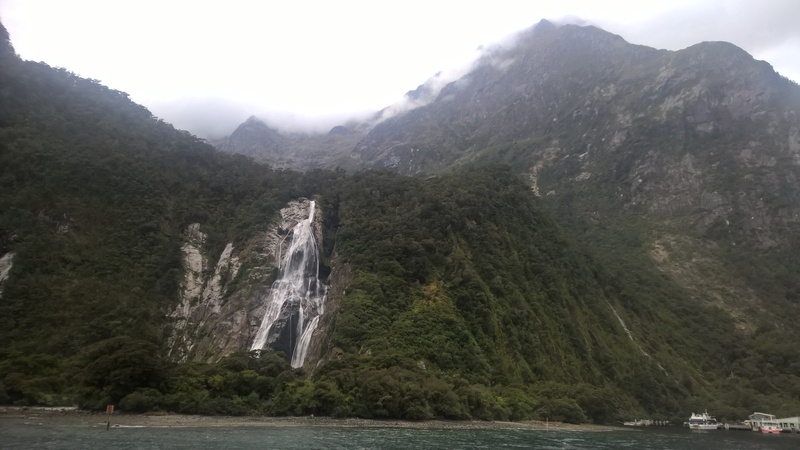 I met another hiker called Daniel who would be tramping Milford at the same time as me and he offered me a lift to the ferry instead of the bus, and of course i declined this offer (how stupid to you think I am Mum? ha ha). 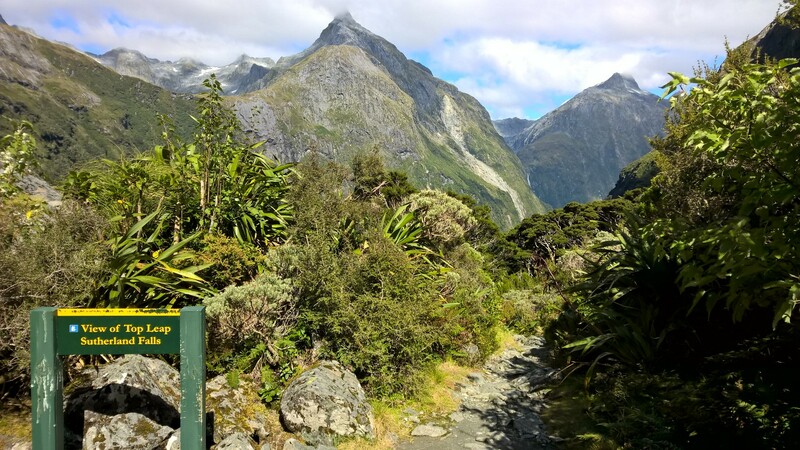 I also met a another gentleman called Lee who had just come from the Keplar track and I quizzed him on what it was like and a thousand other hiking questions. I still had another 1.5 hrs to kill and I was getting very bored, but eventually more hikers came along to wait for the bus and we all got chatting about where we were from and the destinations we were headed for. 5 of the others were heading for the same place as me and it was great to chat to them and feel like I wasn’t going to be alone out there. 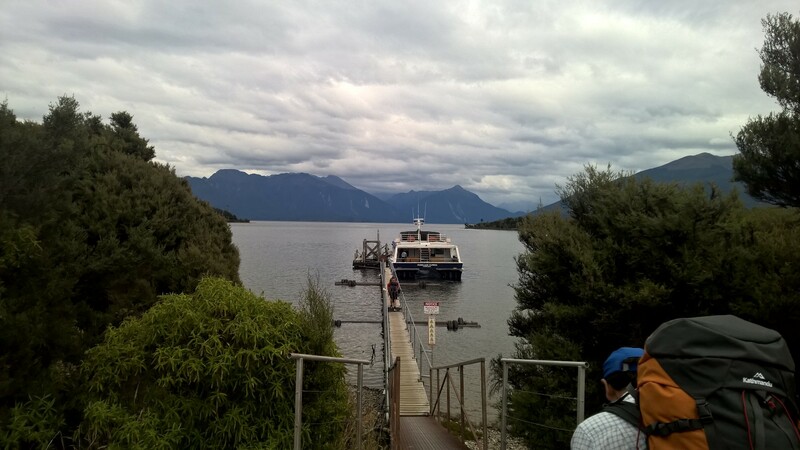 The bus pulled up right on time and we made the 25 minute journey to Te Anau Downs to meet the ferry. Once onboard the ferry I met a lovely young couple Amanda and Chris, Chris’s whole family (it seemed) were travelling the Milford with them too. I also ran into Daniel who I met earlier at the DOC and I introduced him to my new friends. We all chatted happily as the excitement rose the closer we got to end of the ferry trip. 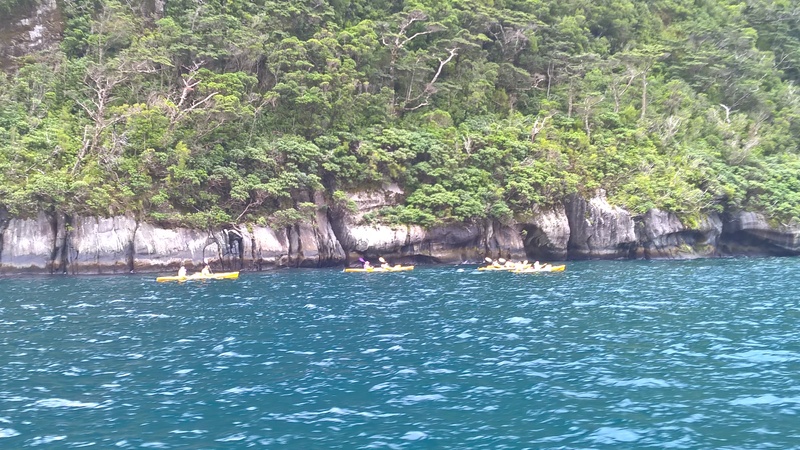 The ferry trip took about an hour and the unguided walkers (us) were allowed off the boat before the guided walkers (woohoo). Of course we all stopped and got photos next to the sign at the start of the track (below) and then headed on our way through the trees. Today’s walk was only very short compared to the rest, a nice way to ease ourselves into the journey. It was about this point that I felt the full weight of my pack and starting to get worried about whether or not i would be able to carry it for the whole week. I adjusted the straps and moved it around until it felt a bit better then kept moving on my way. I walked and chatted with Amanda and Daniel, and Chris’ parents and we took lots of photos, but most of mine all look the same! 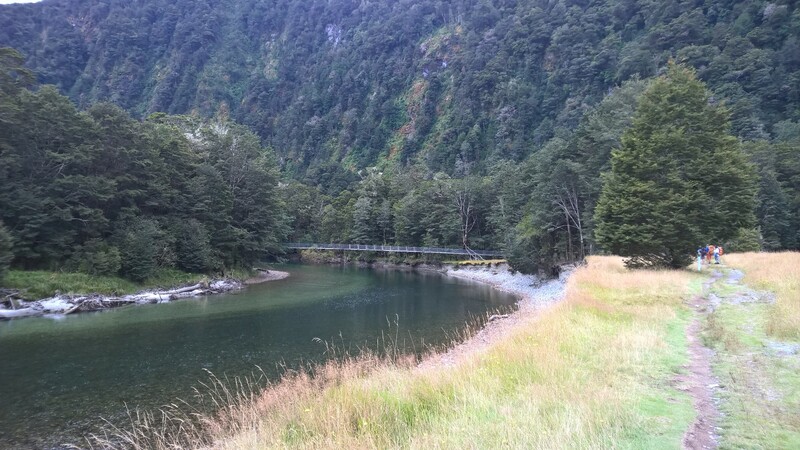 We reached our first bridge and river crossing, which was just after the guided walkers hut and it was much more solid than I had been anticipating, thank goodness! We laughed a lot and chatted about selfie sticks and other happy travels and we hung out for a short break on the pebbly beach we came across (below). The water was freezing but that didn’t stop a few people fro putting there feet in. We noticed how bad the sandflies were and applied more and more repellent to help combat the enemy. We also made another side trip to the Wetland boardwalk which was very educational, but I didn’t get any good pictures here. 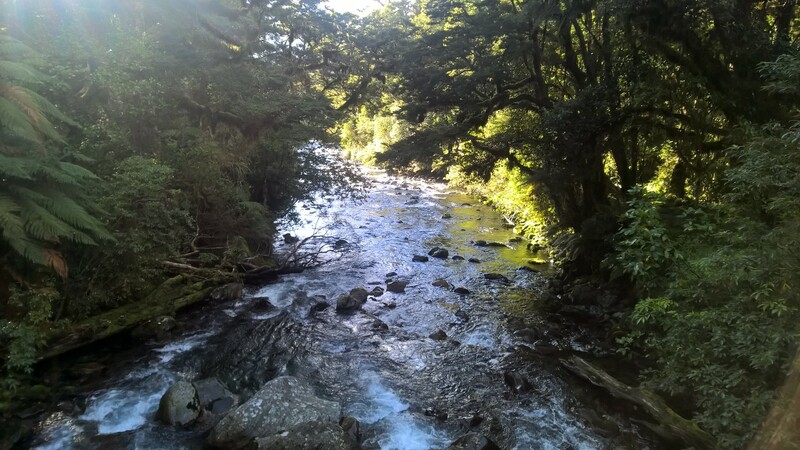 I also ran into a lovely man from Tokyo who had run the 30km Shotover race a couple of days before, and we chatted about the course and how we both went. I thought it was amazing that he had the same idea to do Milford too. 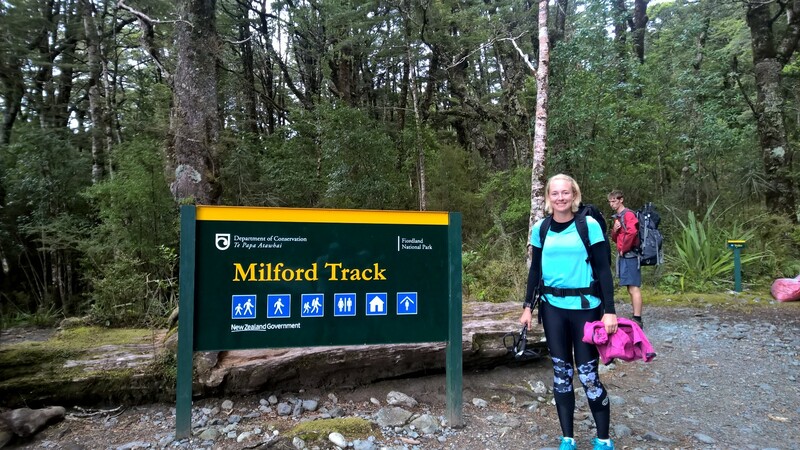 After months of planning I was finally walking the Milford Track – how exciting!! 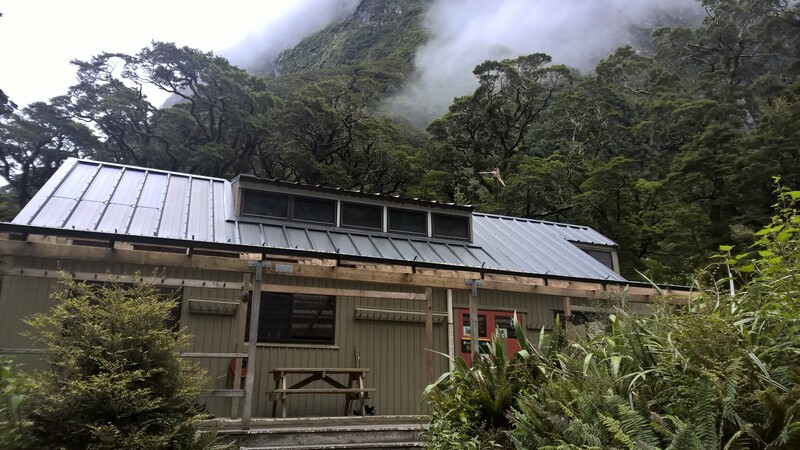 The next stop was Clinton Hut (below) which would be our place of rest for the night. There were 3 main buildings, 1 kitchen and dining area, and 2 huts with bunk beds that slept about 20 people in each. I chose the first one on the left and as I’d got in last I was left with the top bunk right next to the door. It was right next to a window (with no curtain) and the door, but it would have to do. After setting up my bedding arrangements I put on some warmer clothes and grabbed my dinner supplies. We then met the delightful Ranger Ross, a very tall skinny man who had been semi-retired and doing this job for over 11 years. He looked just how you picture a bush range to look. Ross took us on a Nature Walk and it was fantastic!! 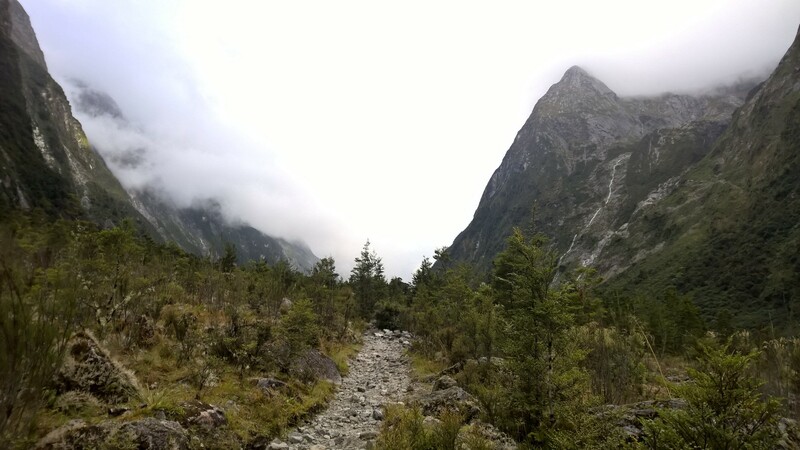 I won’t go into detail here as I’d hate to give away his secrets, but make sure you do the Nature walk with Ross if you’re ever on the Milford Track, and if you take him a bottle of Scotch he will be your friend forever!! 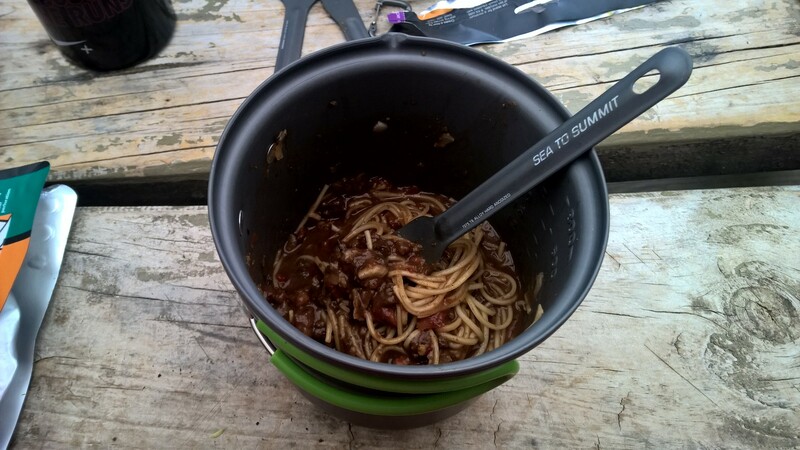 At about 5.30pm I headed over to the kitchen dining hut (far right building in above pic) and prepared my dehydrated spaghetti bolognese (below), and I must say that it didn’t taste too bad. I mean, it wasn’t great but it would do. It had to. It was pretty early to be having dinner but I was quite hungry and tired from the days journey. I had my dinner with Lee, Daniel and 3 veterinarians from Canada who had actually packed and carried red wine with them and they offered to me to have with my dinner. I was very tempted, but could not bring myself to drink what they had carried in by themselves. I also made a mental note to pack wine on my next hiking trip. As soon as we started to lose light i decided to hit the hay, I was feeling pooped after getting up at 5.30am that morning. I put in my ear plugs and got as comfortable as i could, but it turned out to be a very sleepless night. After a restless night I got up to go to the bathroom and when I got back to my bunk I decided to grab all my belongings and head to the main kitchen hut for breakfast and to get my pack organised. 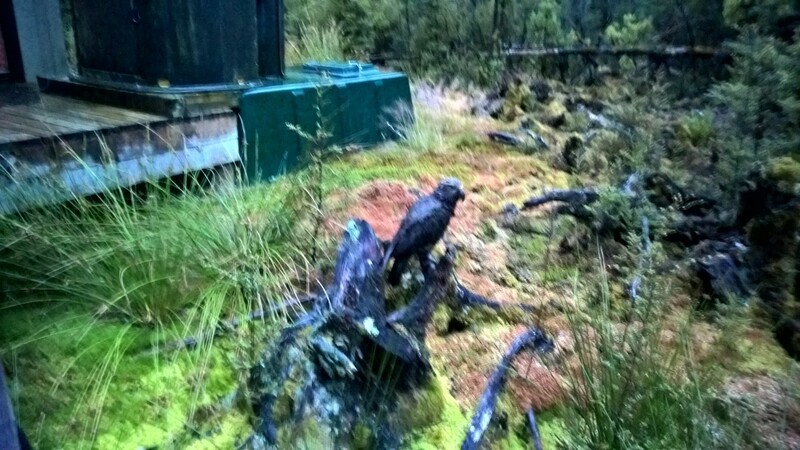 I didn’t want to be nosey rustling around in my bag in the hut. Once I got my gear organised I gave myself a trail shower (cleansing wipes, face washer and water style) and got into some clean clothes. I had a breakfast bar, black coffee and a banana. It had rained a lot the night before so we were expecting a wet day. I saw a Kia (see picture below)) as I set off half way through the group so that I had people in front and behind me. The people in front clear all the spiders away and the people behind will find me if anything happens or I get hurt. That was my philosophy. My bag hurt my shoulders from the moment I out it on, but I adjusted the straps a few times and it started to feel better. Actually it didn’t feel better, but it didn’t seem to get any worse. I walked casually along the trail and could feel my calves burning even though this section was relatively flat. It might be a tough day…. 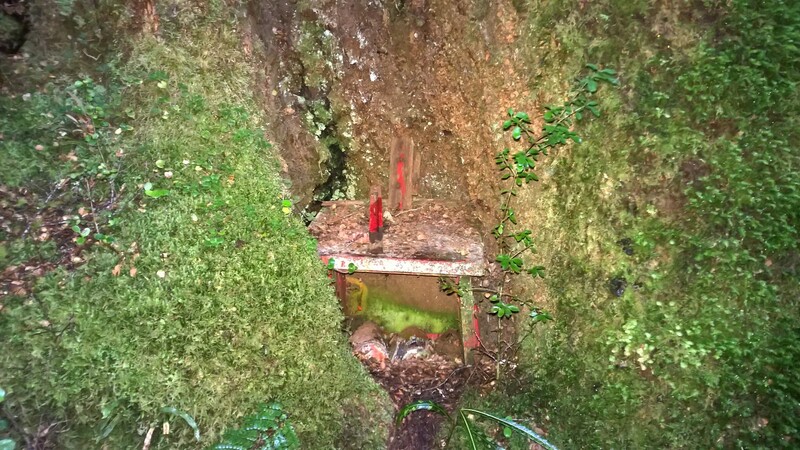 Ranger ross has told us to keep an eye out along the trail for the red telephone box that was inside the tree (see picture below) and I managed to spot it even though it was off the trail a little and tucked away hiding. It’s weird to think that they used to have a phone line along this trail, but it would have been very helpful to them before all the modern day technology that we have today. 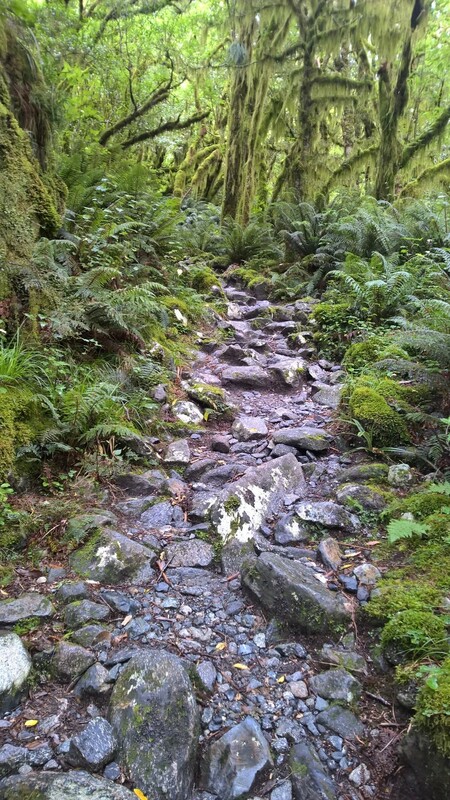 We crossed small bridges and lots of rocky areas. 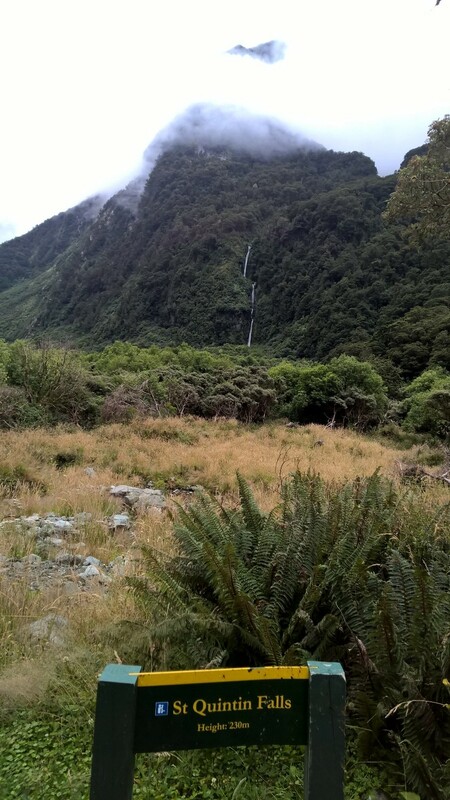 It rained gently for the first half of the walk which meant that there were lots of waterfalls surrounding the valley we walked through. I have never walked alone so much. I cried, I sang and I took in all of the surroundings of the area. It felt surreal being out there in the middle of nowhere with all your belongings on your back, everything you needed right there with you. 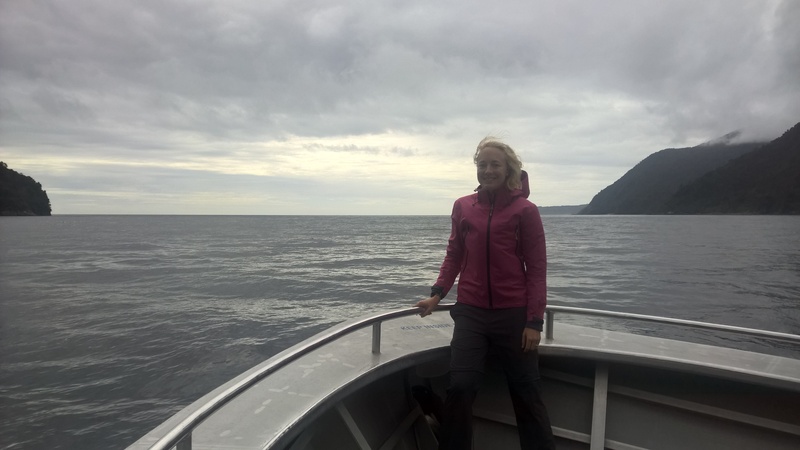 I came to a calm state and thankfully began to feel very relaxed despite the cold, wet conditions. 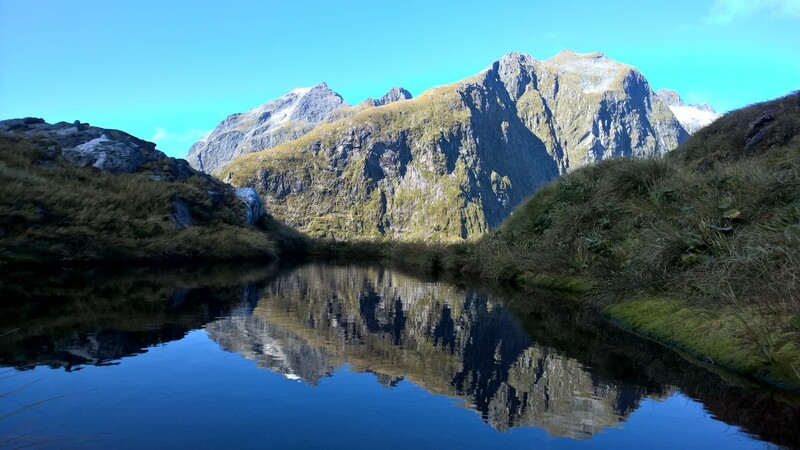 I went to the hidden lake (see pictures below), The Prairie and stopped for morning tea at the Hraire Hut near the river. 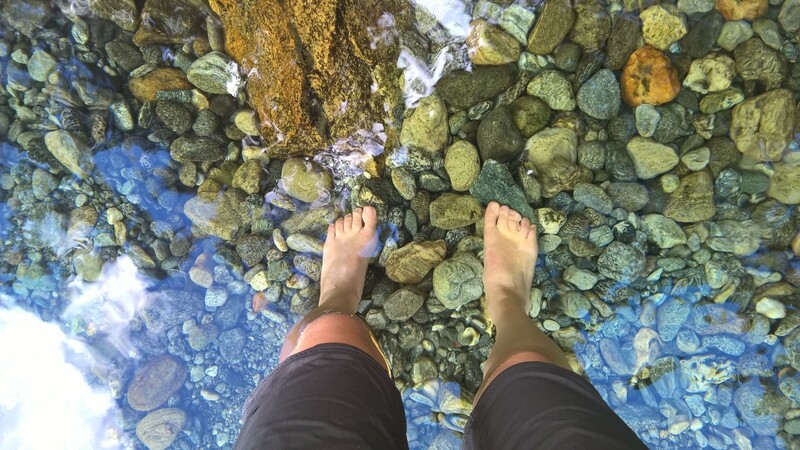 The river was crystal clear and you could see the large fish swimming down the stream unaware of us looming overhead. The rain had eased a little and a cheeky little finch came down to say ‘hi’. 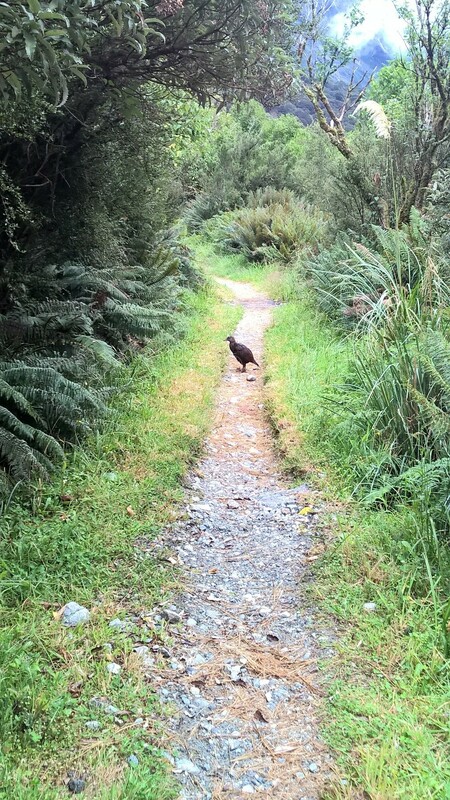 I saw lots of birds along the trail, they were not scared of me much at all and it was really lovely being so close to these birds out in the wild. The mountains around me were covered in clouds and fog so I was’t able to see the mountain tops. I walked using my poles and felt some discomfort/chaffing on my left hip so kept adjusting the straps on my bags to ease the pain. I realised that my straps kept coming loose so I made a mental note to keep adjusting them and try to make them stick in the same spot my tying them close to the top, but that didn’t seem to work which was annoying. 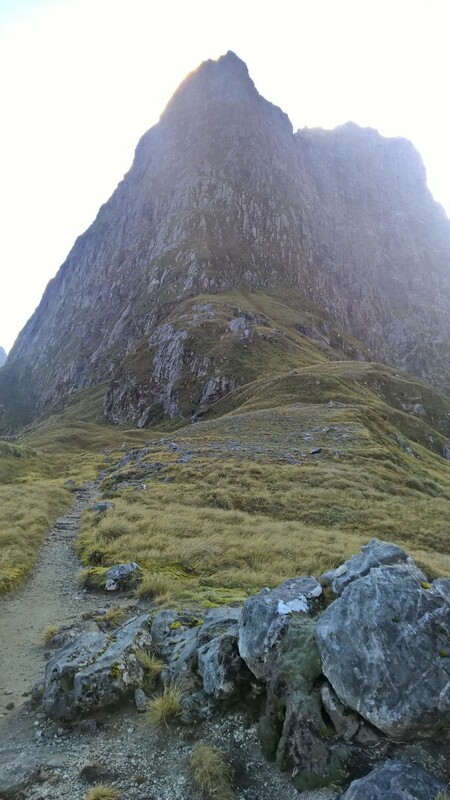 I kept walking and it got steeper and steeper. My calves were really hurting by now and the hills were not helping. I kept plodding on and couldn’t help but smile being in such a beautiful place. I remember thinking how lovely it would be to run in this area and considered ditching my pack for a while to run ahead on the track and back, but I didn’t really feel like I had the energy and my legs may have gotten angrier with me. As I was going up the last hill I ran into 2 Rangers who were heading out to do some repair work to the track. We chatted a little and then parted as I kept moving up the hill towards the next hut. 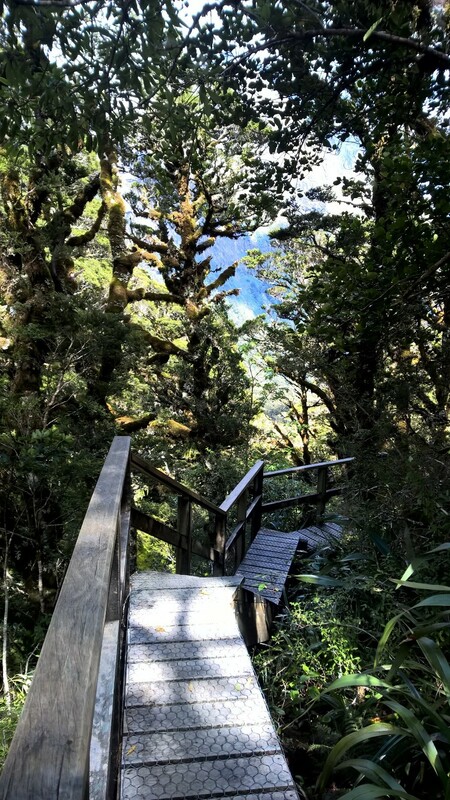 I passed the turn off for the Guided walkers hut and heard a helicopter taking off in the clearing not far from the trail. It sounded weird hearing something so mechanical in the middle of nowhere, but also reassuring that they could get to us if it was needed. The last hill was very steep and it took all my energy and the last of my strength to get there. 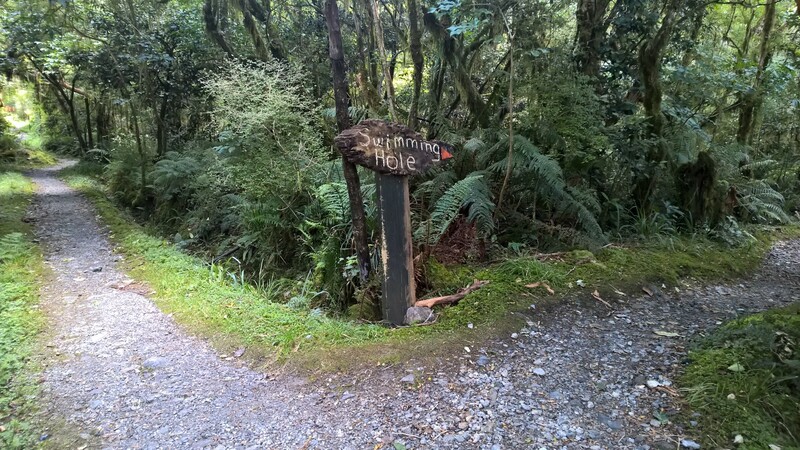 But I ended up getting to the Mintaro Hut (see pictures below) with only 3 people ahead of me. This was great news as it meant I had a better choice for a bed this time, woohoo!! There were 3 rooms to choose from, so i chose the one that did not have my snoring friend from the night before and prayed that the 2 guys already in this room would be non-snorers. I sat down and got my gear organised, changed into some warmer clothes and made myself a hot chocolate. 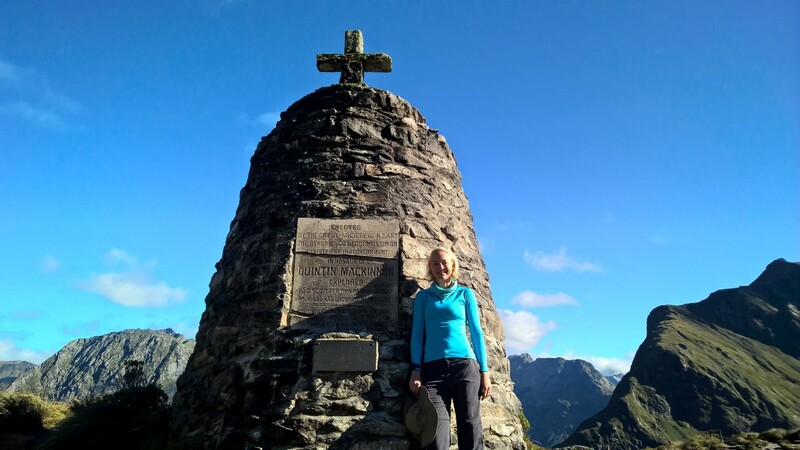 I chatted to lots of other hikers as they came in and realised that I’d just about met everyone in our group now. There were only 2 people that seemed to get on everyone else’s nerves, an American couple who were loud and very inconsiderate of others when it came to all matters. The guys got the fire cranking as I put on more layers of clothes and wrote in my journal beside the fire to warm up. 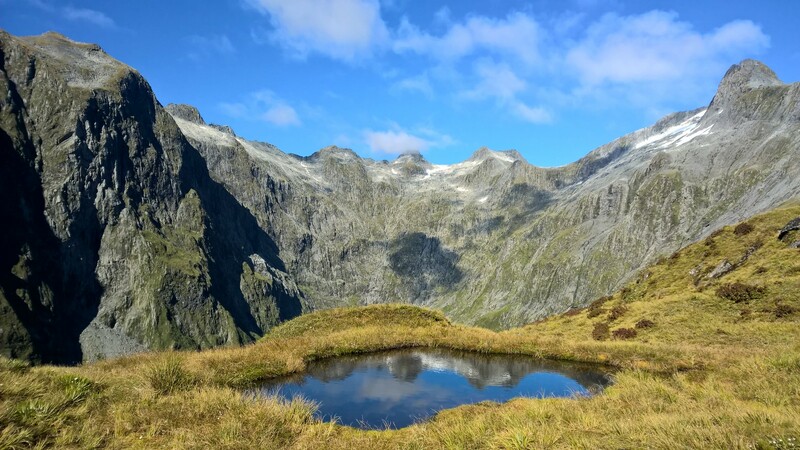 I spent the afternoon resting and recovering as the next day would be our biggest climb up to the Pass and then a huge descent into the valley to the next hut. 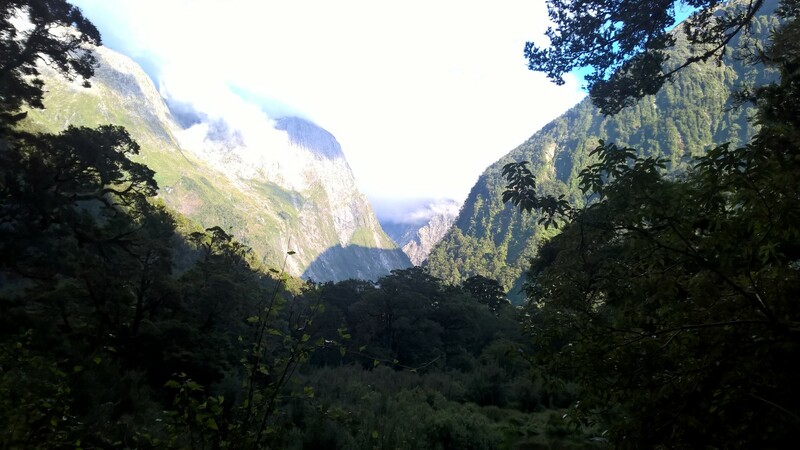 We all hoped the weather would clear for tomorrow’s hike which was supposed to be the most beautiful part of the trail. The Ranger gave us a talk at 7:30pm but it was nothing like Ross. This guy was a young English lad from the UK who had been here for 6 months. I sat and chatted to a couple from Israel, they were lovely and taught me how to play an Israeli game called Yanniv. We had some others join us and Bar taught me to play another game called Shithead. There were a lot of laughs and it passed the time quickly. Some of the hikers decided to walk up to the Pass late in the afternoon when the sun came out but I decided to keep resting the legs and pray for good weather the next day. For dinner I had dehydrated Teriyaki Beef and I added some rice to bulk it up a little as the meal the night before had not really been enough. I was so glad to have bought the rice as a back up if I got hungry. 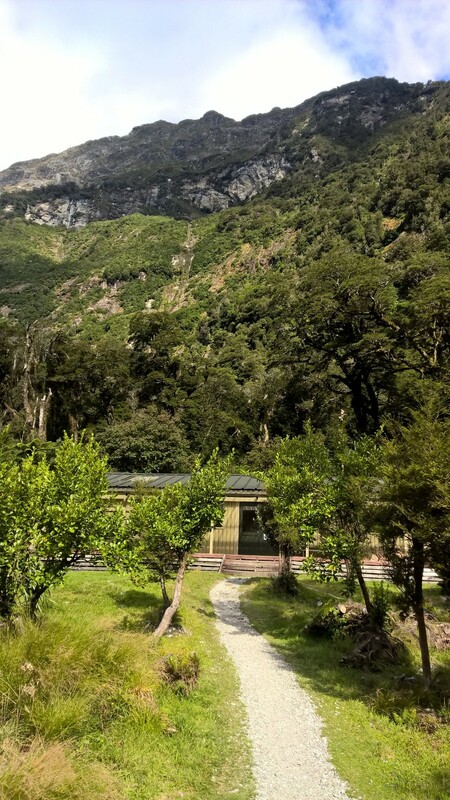 I ate my 2 carrots raw as i couldn’t be bothered cooking them and after dinner I read through a large wooden book kept in the hut and learnt more about the Milford track. Before bed I went to visit the ladies and when I looked up at the sky it was clear as ever and filled with thousands and thousands of stars. It was breathtaking. I’m not sure how long I stood there for but it was something I’ll never forget. Beautiful. I don’t think I got much sleep during the night, but I think I did get more than the night before which was something. When the early birds in my room got up I decided it was time to rise and shine too. I had my ‘trail’ shower and got into some clean clothes and then had some breakfast, the same as the day before. I was a little jealous of the hot breakfasts that people around me were having and made a mental note to take something similar for the next hike. Todays hike would be the toughest one and so I ate a little more than most mornings. I got my pack on and headed for the trail with only a few hikes in front of me. I was feeling pretty tired but was happy to see the sky was clearing and hoped it would be even brighter when we got up to the pass. 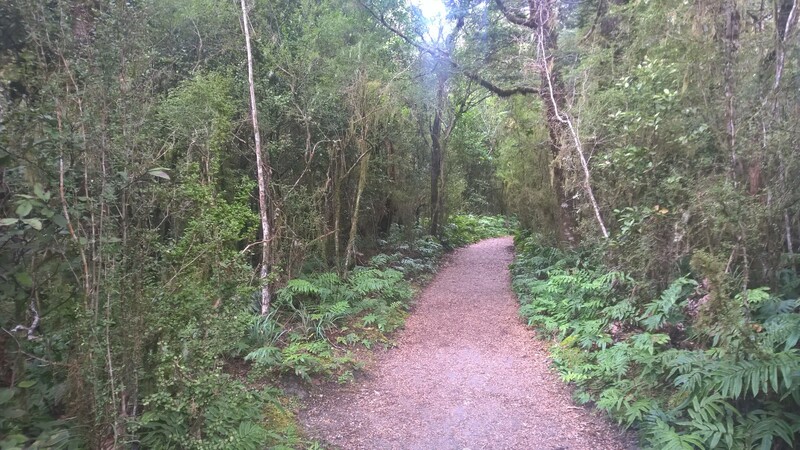 The rainforest was green and vibrant and the birds were singing all along the trail. I caught up to a Canadian couple I had met that morning while having breakfasting hiked with them for the next section. We also ended up hiking with couple from Canberra (Penny and ?) who were experts on the trail and really great conversation. 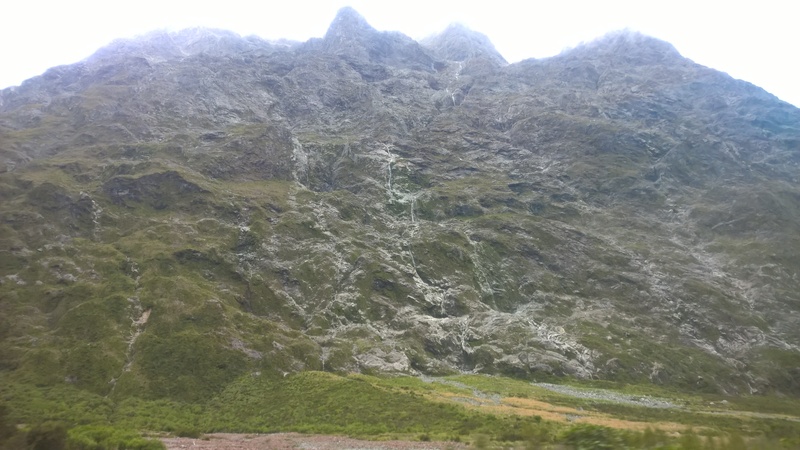 The time flew by having their company and before we knew it we were at the Mackinnon Pass. 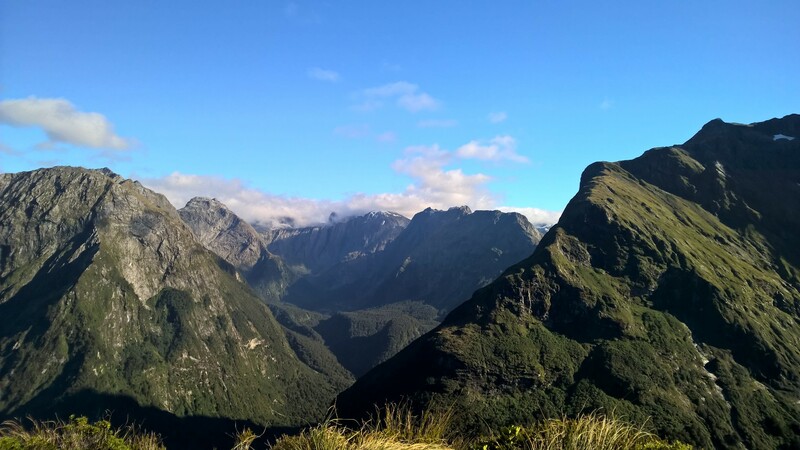 It’s hard to describe how I felt up there being so high and surrounded by beautiful mountains. The endless views and blue sky really took my words away. I took a lot of photos up here and they don’t do it any justice. I had a quick snack while I was at the top here too and made sure I had plenty of water as I had;’t really f=drunk enough the day before and felt a bit dehydrated when I woke that morning. I put my pack back on and climbed up another section to the highest point of the trail. 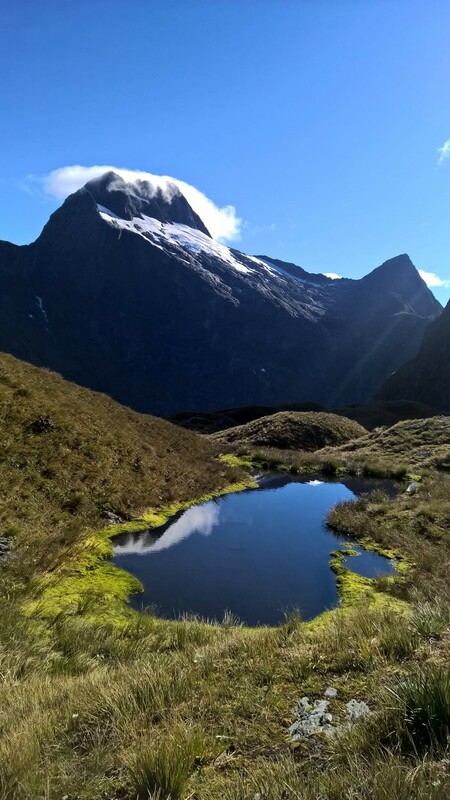 The little pockets of water on the tops of the pass were still and reflected gorgeous mountain tops in them. 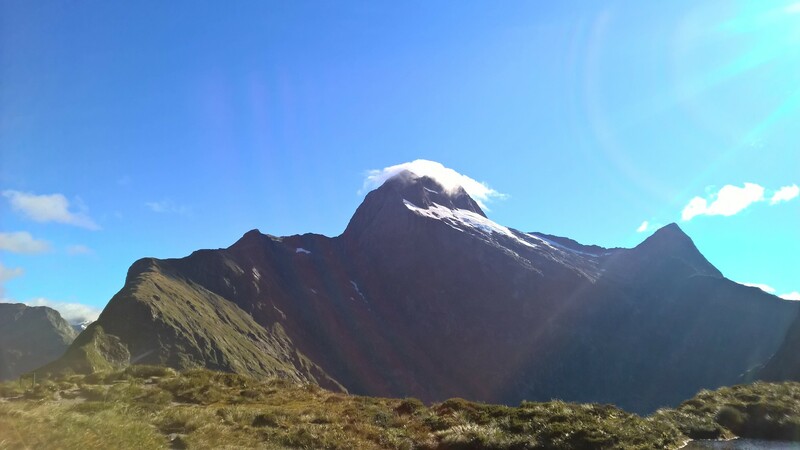 There were some snow capped peaks, including Mount Elliott. 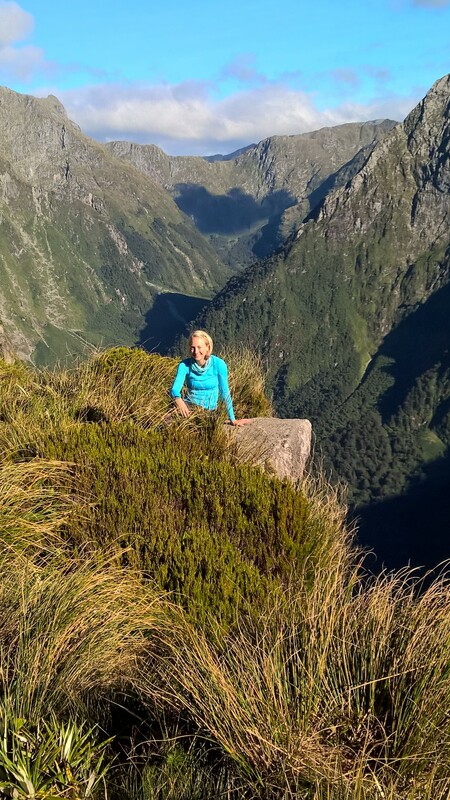 This was such incredible place, I felt on top of the world – literally! I stopped at a hut on top of the mountain and made a cup of black coffee and had some more snacks. 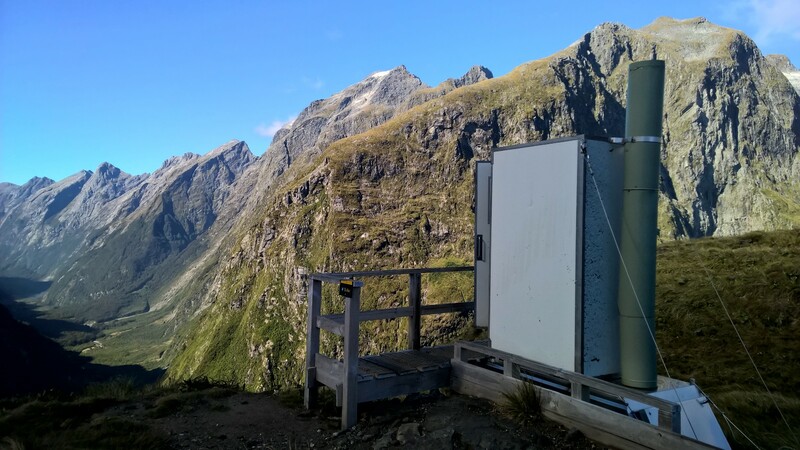 we used the ‘Loo with a view’ (see below picture) which looked back down towards the valley where we had walked that morning and the previous day. Amazing! The temperature had dropped up here so I applied some more layers, I put on some gloves and my beanie too. But I ended up removing them only a little while down the trail as it got warm and we were exposed to the sun for most of the rest of the hike that day. I hiked by myself for the rest of the day, over taking a few people along the way. i enjoyed the quiet time. 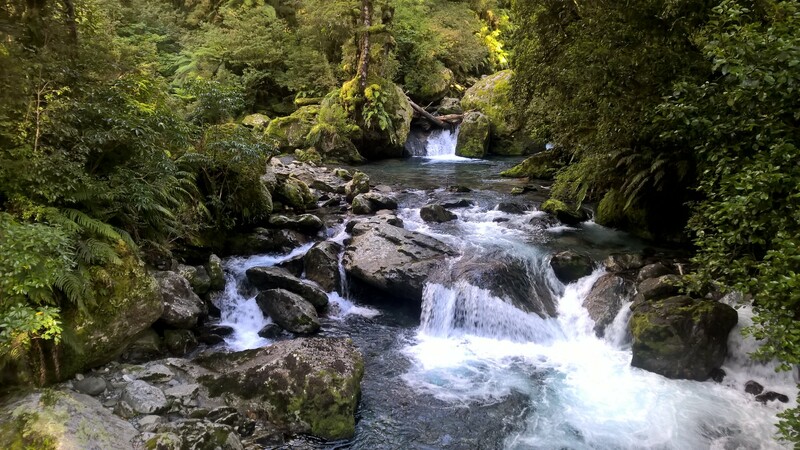 I went on a swimming bridge over the Clinton River and eventually got to the Roaring Burn (see pictures below), a large waterfall that was really loud and powerful (as the name suggests). 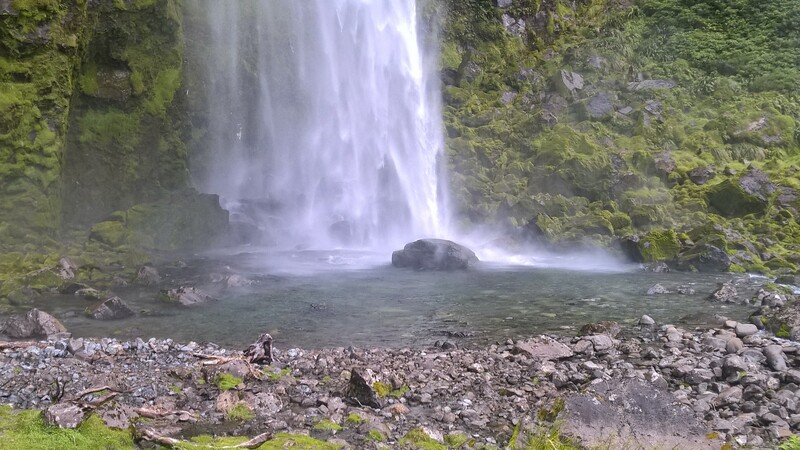 I walked down some wooden steps on the side of the mountain beside the waterfall and it was gorgeous! 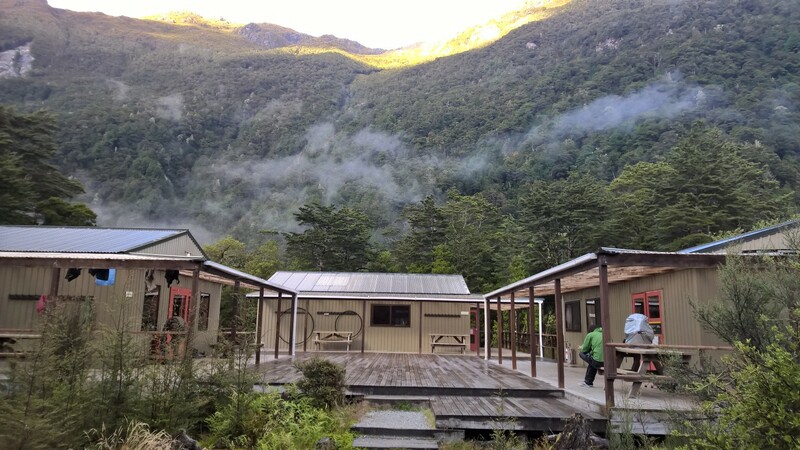 Eventually we got to a cluster of huts where there was a day shelter for us to use and I ran into Seth who had just got back from the Sutherland Falls. This was an out and back section and a chance to walk without my pack!! 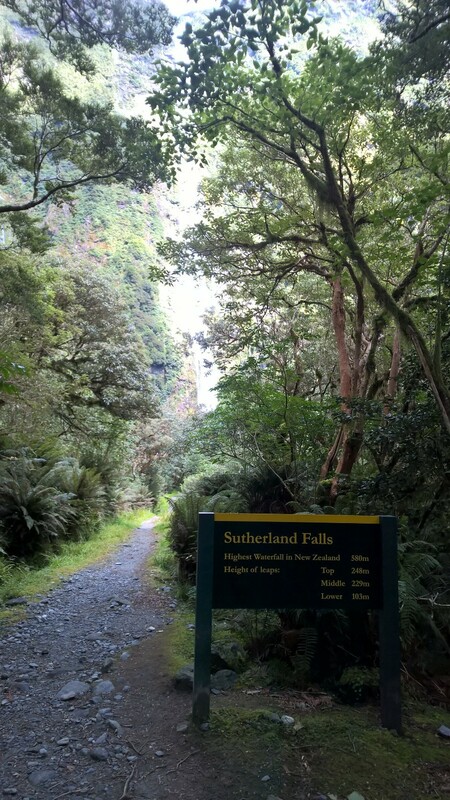 I gladly dropped my pack and had some food and water, then made my way out the door towards the trail for the Sutherland Falls. It was so nice not to be wearing my pack that I decided to run this section and it felt amazing to be moving with a but more speed again. 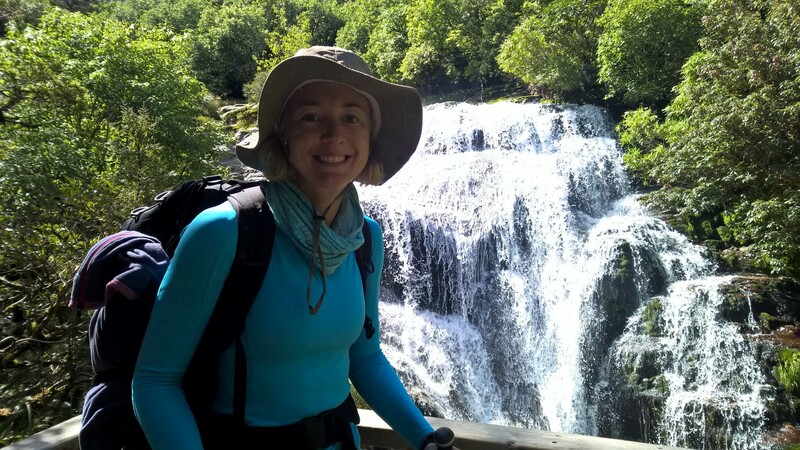 I cruised along the trail with my poles all the way to the falls and the spray at the bottom of the falls was very refreshing after the short run. 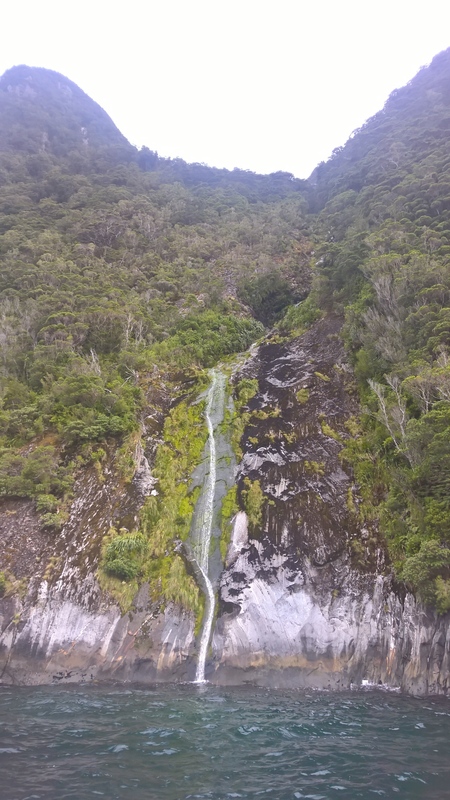 Check out the falls pictured below. When I got back to the shelter I didn’t waste any time. 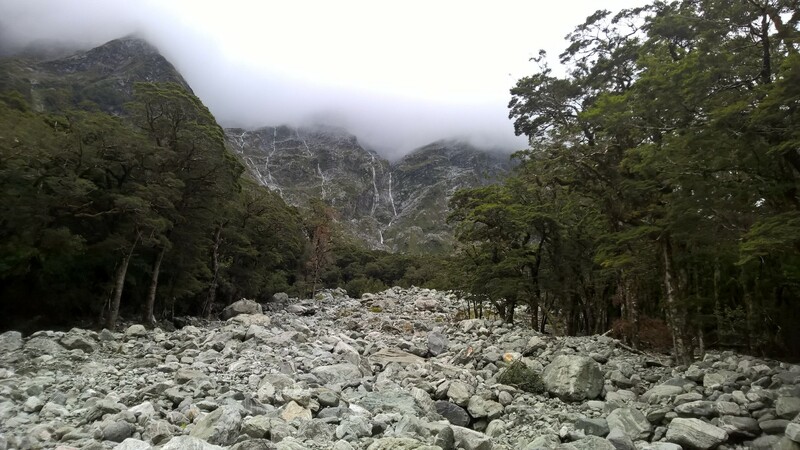 I grabbed some water and put on my pack heading for the next hut which was apparently only an hour away, but I thought I could get there quicker. Challenge accepted. I did it in 40 minutes. 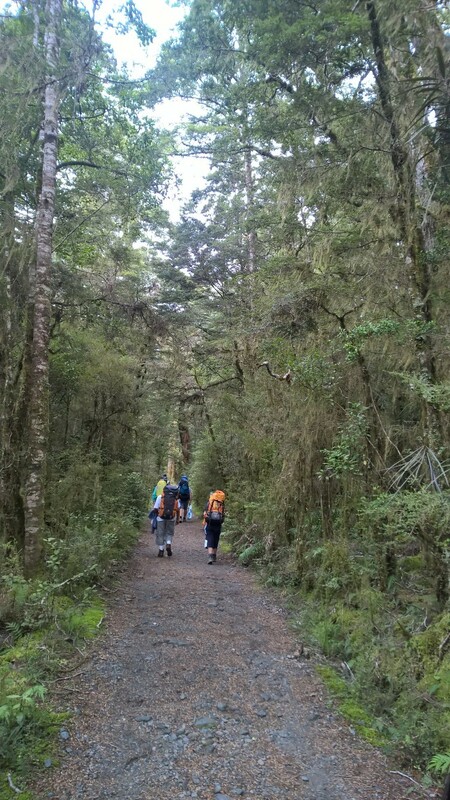 It was a lovely downhill section, very rocky and rainforest and beautiful. 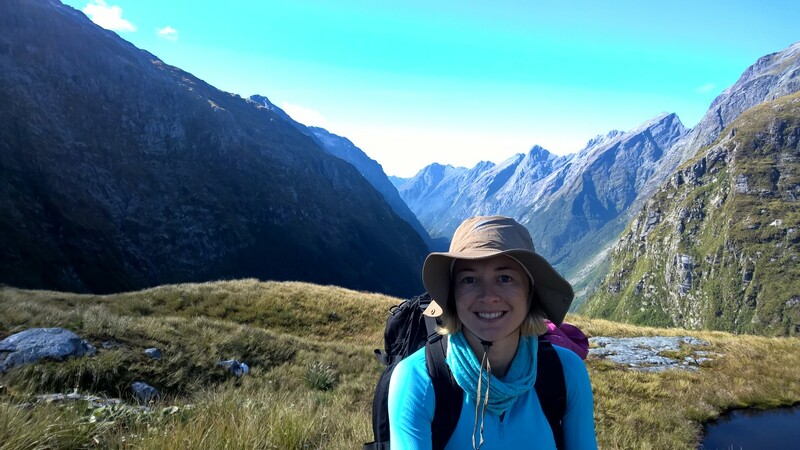 I dumped my pack in the first hut with a nice couple who I hadn’t roomed with before and they told me of their hikes on other mountains all over New Zealand. I certainly was learning a lot this trip and already wanted to come back and do more. As I chatted to them I notice my calves were aching. They actually felt bruised all over and were sore to touch. I think they were even swollen. Not good. 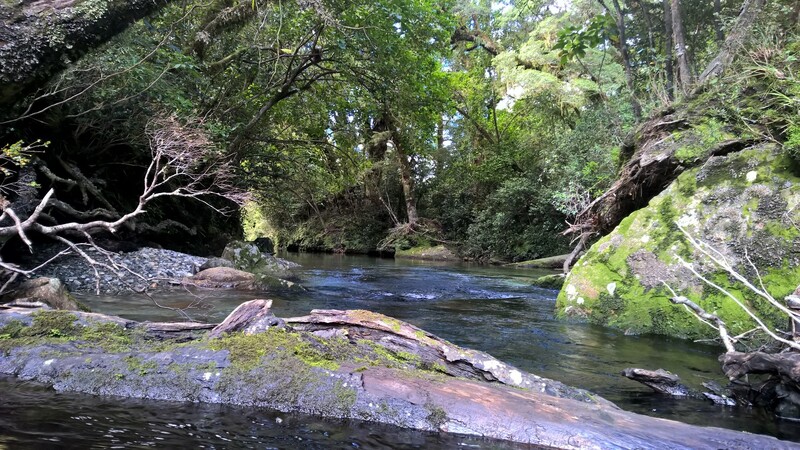 The couple mentioned a nearby waterhole (see below pictures) so I decided to pout on my shorts and head down to give my legs a dip in the cold (freezing) water to help ease the muscles. My legs felt so much better after the dip, it was heaven. The water had been bitterly cold, but I lasted about 3 minutes before it got too much. Some people actually went all in and i’m not sure how they did it. Tonight was our last night on the trail and we had a 6 hour walk ahead of us tomorrow. I decided to have a nap and then hopefully wake refreshed and ready to make a plan for the next day. Unfortunately the nap didn’t happen but I did rest the eyes for about half an hour before I got up and headed to the kitchen/ dining hut to write my journal and get ready for dinner. On the menu tonight was dehydrated Pasta Vegetariano and although I picked out a lot of the ingredients it was’t too bad. After dinner Ranger Jen gave us the run down and then took us down to the swimming hole for a feeding of the eels. 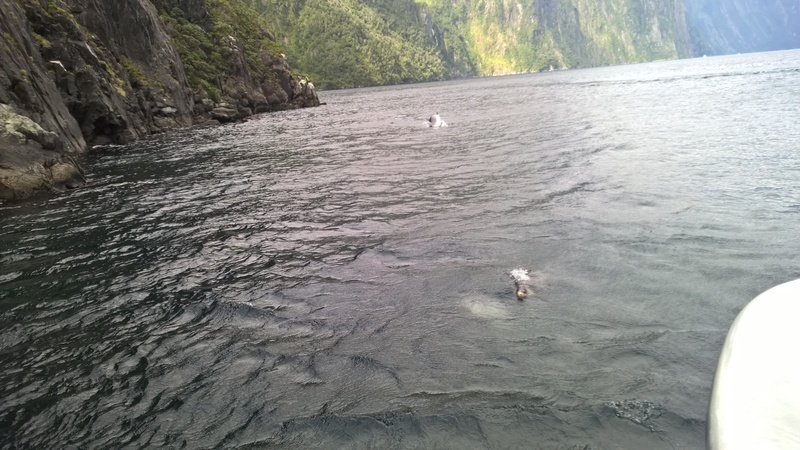 She fed them a mixture of tuna and water, and about 3-4 large eels came out to take advantage. they were pretty huge and ugly. One of them tried to eat the guys GoPro! I found out that eels can live to about 100 years old, who knew! 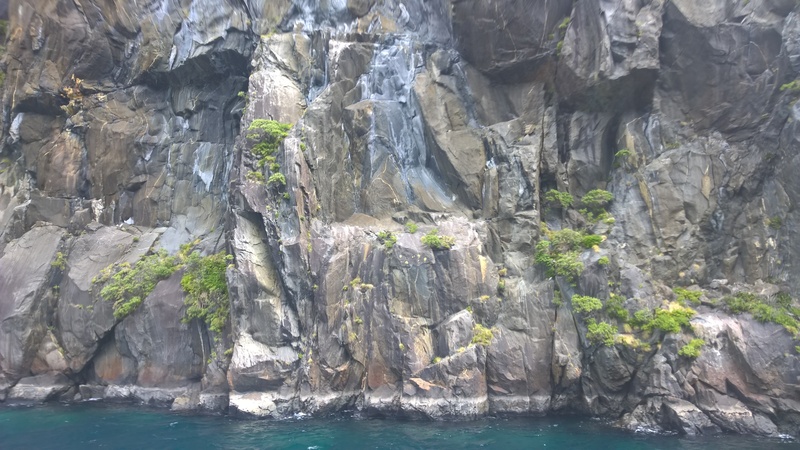 The sand flies were really bad here so i didn’t stay down at the water for longhand I headed up to the Dumpling Hut to have a ‘trail’ shower and get ready for bed. I planned to have an early night as my body was feeling exhausted and sore all over. Thankfully there were no snorers that night, just the noise (annoying) American couple I mentioned earlier. It sounded like everybody in my room got up at 5am and decided to make as much noise as possible. So annoying. But I thought if you can’t beat them, join them! With that i got up and headed to the kitchen for some breakfast, making sure that I ate most of my food so al I had to carry were a few snacks and lunch for the day. I had my ‘trail’ shower and when I got back to the room everybody was up and packing their bags. It was supposed to rain that day so we readied ourselves for a wet trip, making sure our clothes and belongings wouldn’t get wet. I headed out about halfway through the pack again, some slower walkers had got up super early as we had to be at our ferry by 2pm and they knew they would take longer than some of us faster walkers. 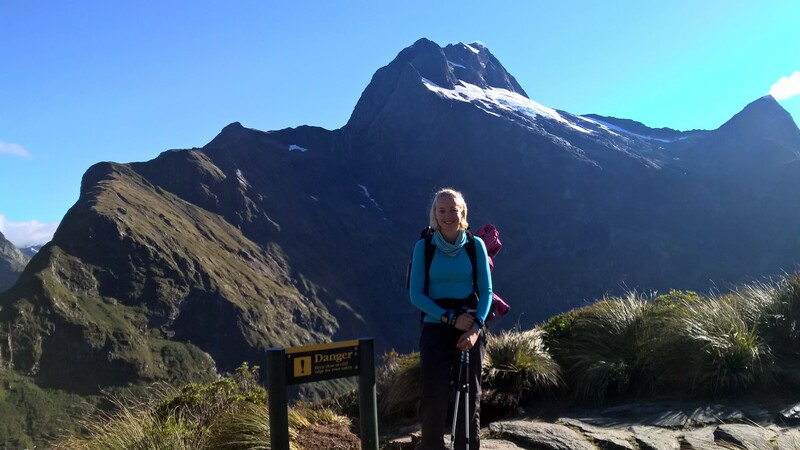 I was feeling very tired, drained, sore and saddened to know that it was my last day on the Milford Track. 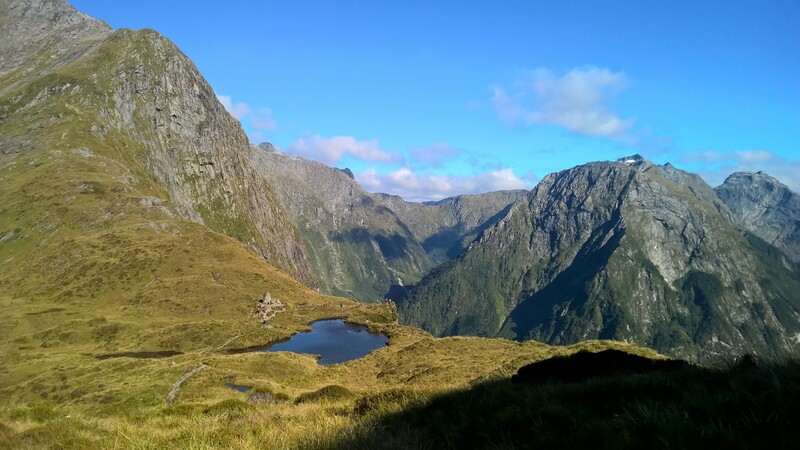 But so happy to have made it this far and been lucky enough for the gorgeous weather over Mackinnon Pass. It was long before I overtook some hikers in front of me and I even caught up to the 2 guys speaking to the night before (the speedsters Scotty & Mark) when they stopped to adjust their packs. They were walking a little faster than I would have liked but they were really great company and I spent the rest of the day hiking with them. They had met in the UK but Scotty was originally from NZ and Mark from Bermuda. They had taken a year off to go travelling, lucky buggers!! 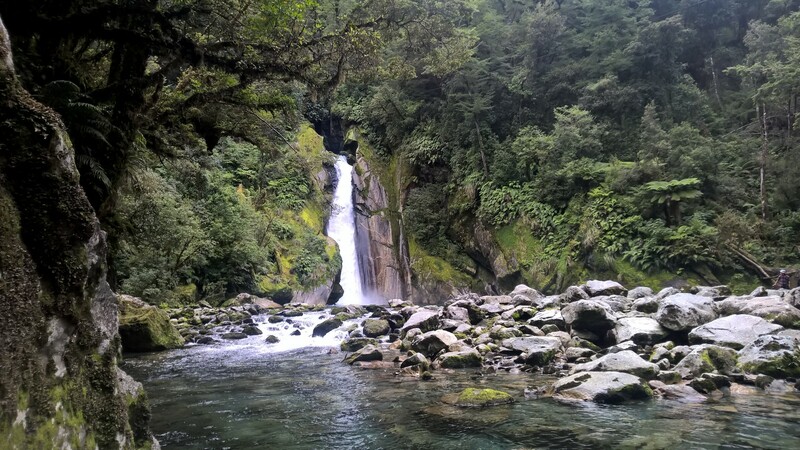 The weather was warm so we removed our rain jackets and hiked past rivers, waterfalls and rainforests. The scenes were like something out of a movie, gorgeous! 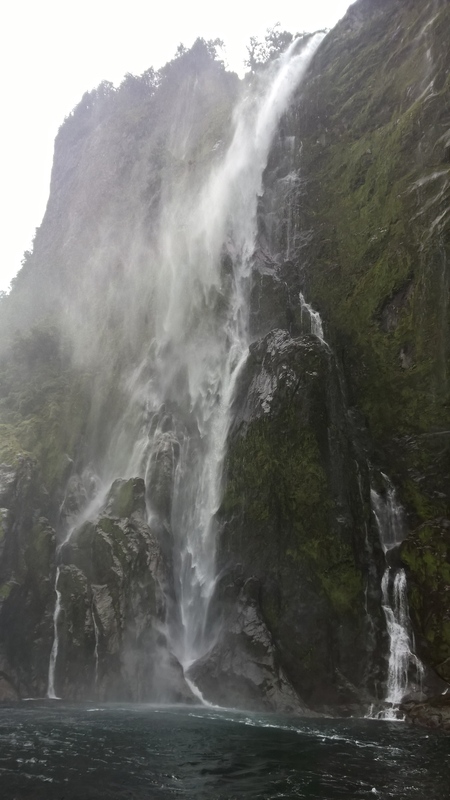 We stopped at some falls and checked out Bell Rock, it was actually a hollow rock that you could crawl under and stand up inside, very cool. 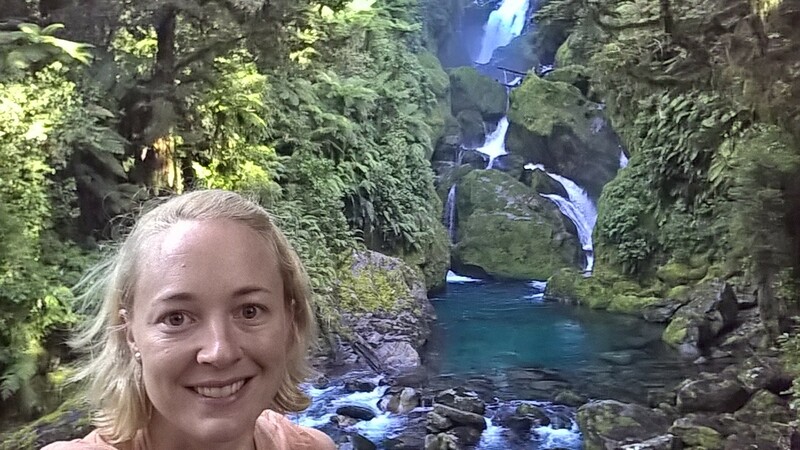 The water was so clear too and check out the luggage under my eyes (below). I remember Mark accidentally slipped down some stairs at one point and poked me in the eye. It hurt a little and he felt awful, but it was so funny! I’m glad we could laugh it off and it had’t been worse. 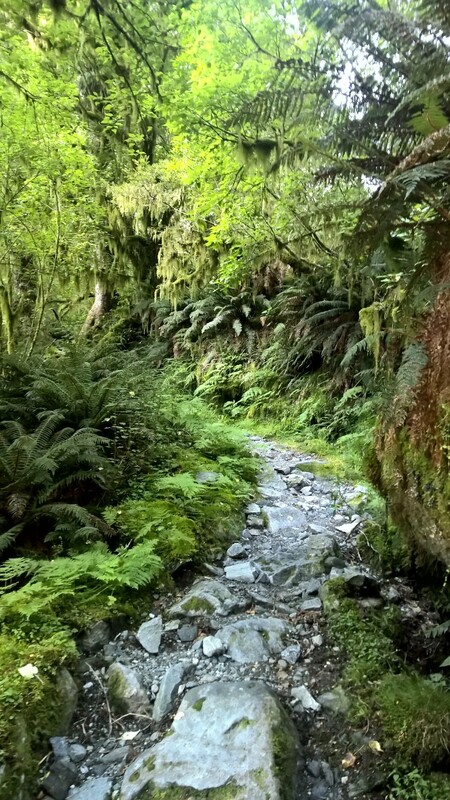 We headed back out on the trail animist of today’s walk was through rainforest. there were a few beach sections and some peaks in the distance too. We were starting to get really hungry and were looking for a good spot to stop and eat, but nothing looked suitable and we didn’t want to block the trail. 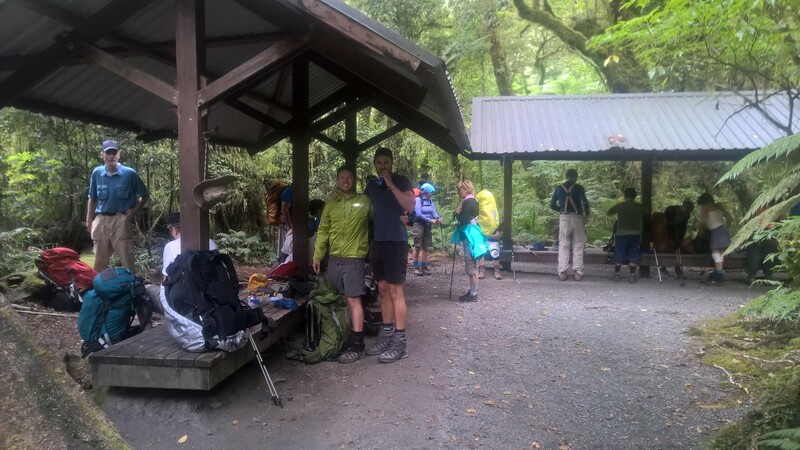 After about another 30-40 minutes we found a rest area and got stuck into some lunch and chocolate. I think the trail would have been very lonely without there company, such a nice couple (pictured below). Many other hikers we had overtaken caught up to us again here and we all chatted about how wonderful an experience we had been having, and how lucky we had been with the weather. 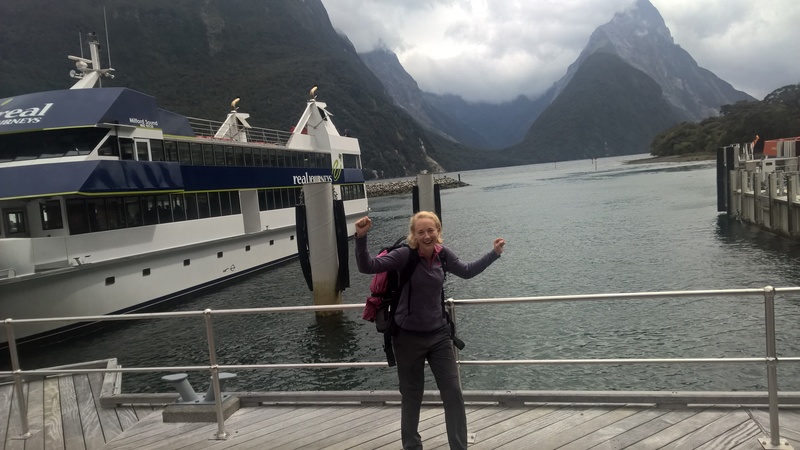 Eventually we got our packs on and were moving at a pretty speedy pace, but I had to make sure I got on the 2pm ferry or I would miss my connecting cruise on the Milford Sound. 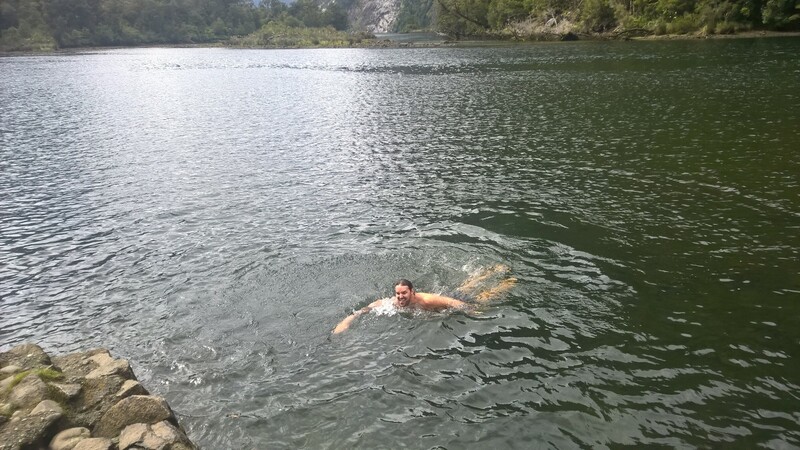 We ended up making it to Sandfly Point with plenty of time to spare and Mark decided go for a swim after a lot of heckling from Scotty and myself (ha ha). There was a little hut for us to escape from the Sandlies and I finished off the food in my pack here, plus got some water into me and filled up my bottles. We all had our photos taken next to the famous sign (below) and then boarded our ferry back to Milford terminal only 20 mins away. We got to the cruise terminal and all said our farewells. 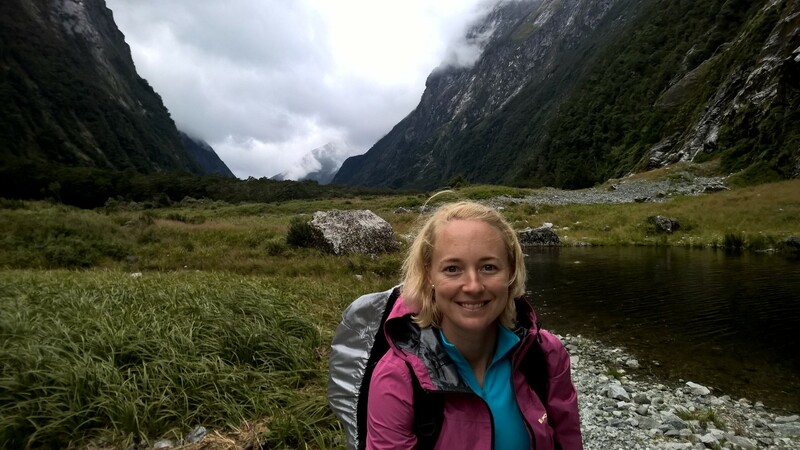 It was sad to be leaving the group and the trail but I was happy to be back in civilisation (I think). 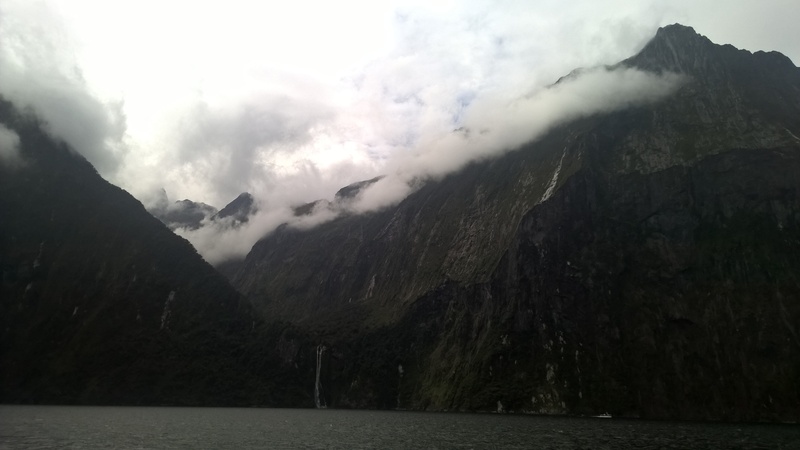 I found a powerpoint and charged my mobile phone at the terminal so I could get some photos on the Milford Sound cruise, the battery had died minutes before so it was perfect timing! I collected my cruise ticket and Daniel bought a ticket to come and join me on the cruise. When we boarded the boat we were so excited to be offered free coffee and tea. We had not had this luxury for a week and I think I had 4 cups of the stuff. The lady even offered us a hot chocolate which was normally reserved for the staff, it was delicious!! The clouds, fog and light rain had set in again but it didn’t matter. 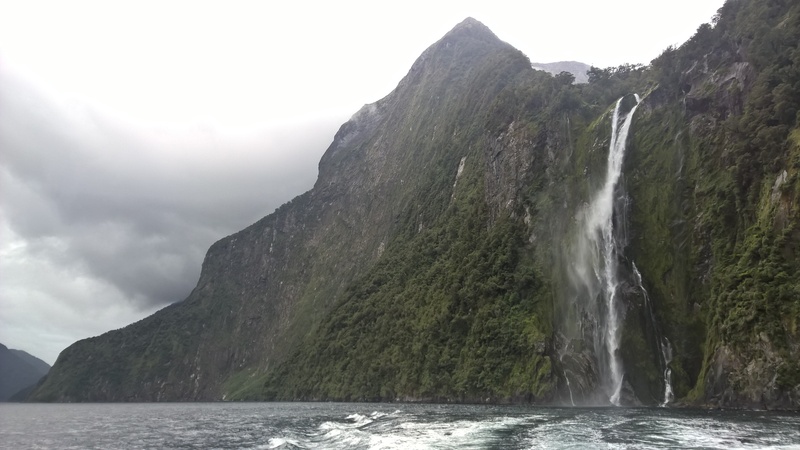 The Milford Sound was gorgeous with waterfalls all around us. 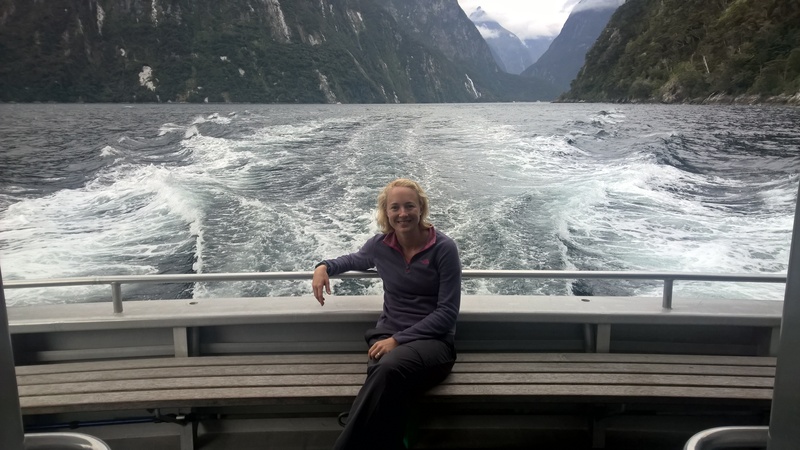 I saw the Mitre Peak who h was enormous and near one of the fishing boats we saw a group of Albatros birds, they were huge and glided through the air behind the fishing boat hoping for a feed. 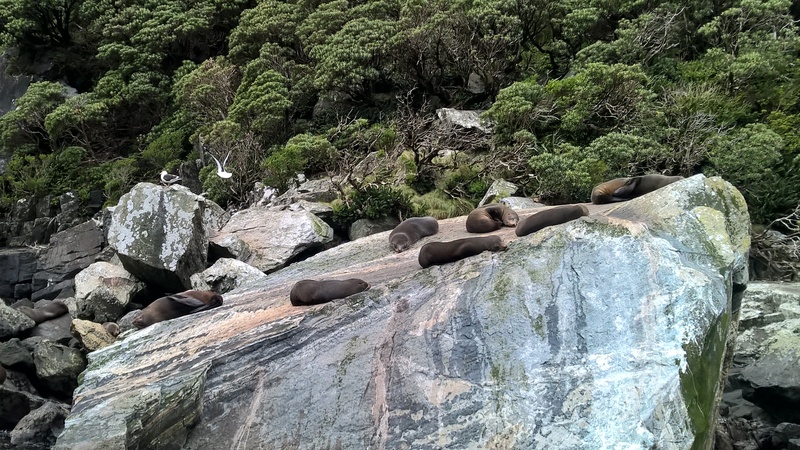 We saw seals taking a nap on the rocks in several spots around the sound and the highlight was the pod of 20+ dolphins that swam right up next to our boat. Dolphins are my most favourite animal (aside from dogs) and one of the dolphins swam next the bow right underneath me for what seemed like an eternity. 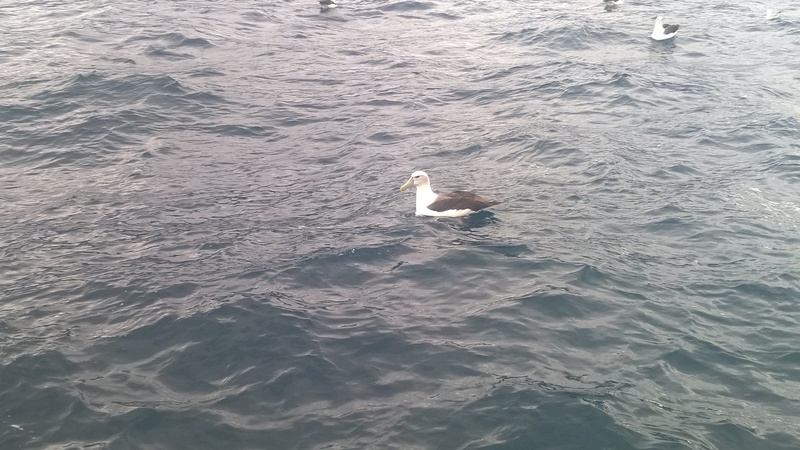 He was almost 4 metres long ad so graceful getting his free ride at the front of the boat. 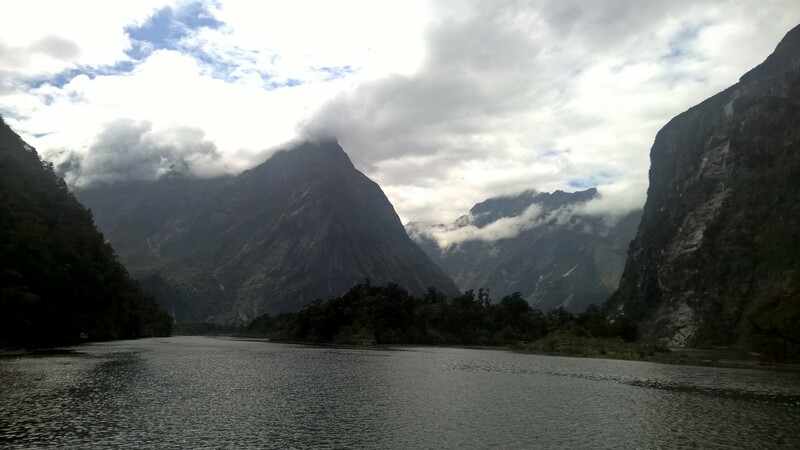 It really took my breath away, something that had happened so many times of this trip. On the way back to the terminal our boat went under a waterfall and most people on the deck got soaked, it was hilarious! I chatted to a lovely couple from Denmark (I wished I’d gotten their contact details) and they took some photos for me with my camera too. Check out my photos below. 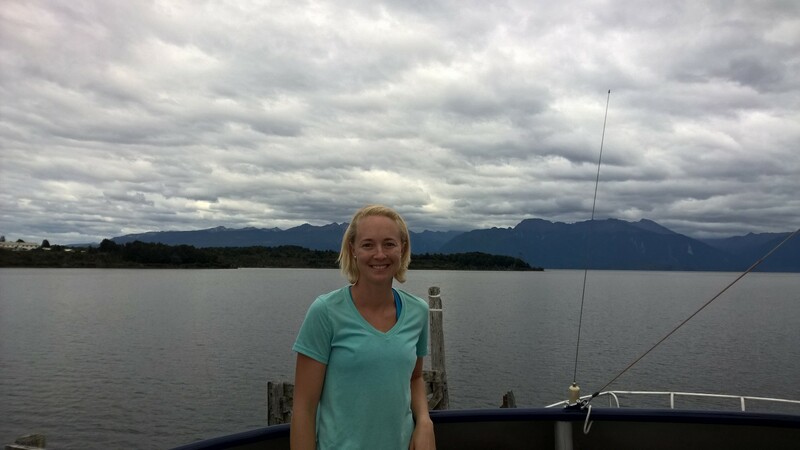 We got back to the terminal and ran to meet our connecting bus which would take up back to Te Anau. What an incredible day it had been! 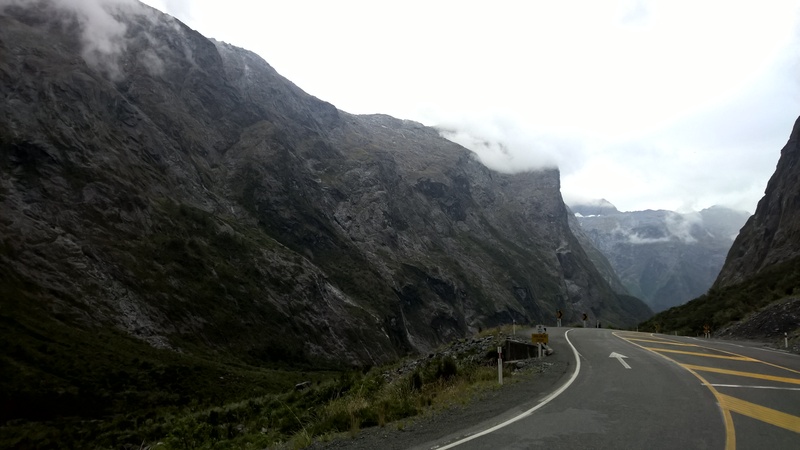 I sat in the front with the driver to avoid motion sickness and was thankful that I had as the road was very twisty and there were lots of turns going up and over and won the hills. Daniel actually asked to driver to slow down a little, as we learned he had been in bad bus crash during a trip in Argentina and he had broken his back. This was actually his first trip hiking since the accident. Poor guy, sounds like he’d had a rough time. We stopped at the start of a tunnel which went through the mountain, it’s a one way tunnel that runs for 1.5km and when it was built they had to dig and carry everything out by hand. It would have taken years!! A few of the people from our hike were on the bus as they had done cruises with other companies, so it was nice to see them again too. I started to get veery sleepy. 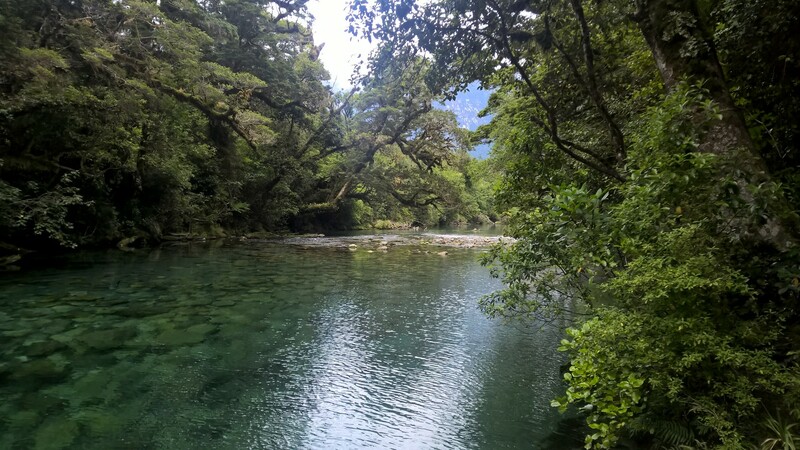 We dropped of people at different stops and I was the last stop at the Te Anau Caravan Park. It was now 7pm and I was feeling utterly exhausted. I checked into the place and got the key to my single room, I would have to share a bathroom and kitchen but that would have to wait. I dumped my pack and headed into town to do some shopping for my next Trek which started tomorrow. It took 20 minutes to walk into town and I went to the supermarket where I got all my supplies for the next journey ahead. I tried to carry lighter and smarter than last time and I think it worked. On the way back to the caravan park I stopped and got fish and chips for dinner, followed by ice cream dessert. The ice cream was so good as I had been craving milk. After scoffing those down I gathered my shopping and headed back to the caravan park. It started to sprinkle with rain so I quickened my step and it was pouring by the time I got back to my room at 9pm. I still had to do my washing, dry it and pack for tomorrow, so it was going to be a late night. I got all my dirty clothes and headed for the laundry. I did a load of washing and stuck it in the dryer hoping it would not ruin the clothes. 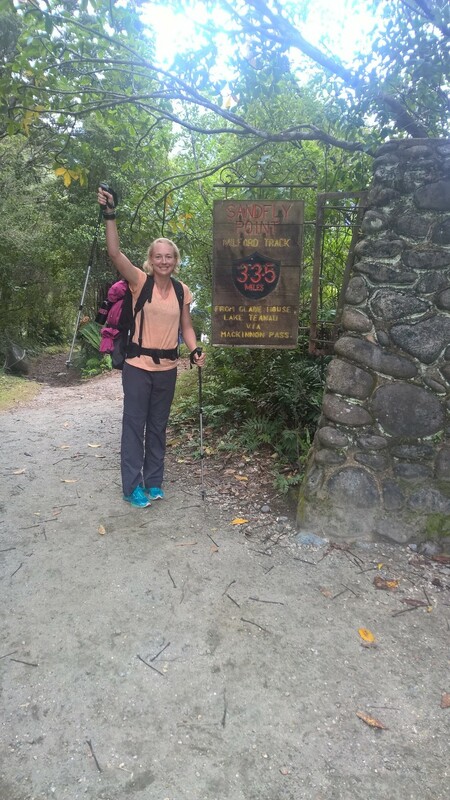 i chatted to an older man & his young son who were holidaying and hiking together, they were from the US. It was great chatting to them to pass the time and I eventually got back to my room at about 10:15pm. By now I was having trouble keeping my eyes open but I had to pack. So I took a swig from the bottle of wine I’d just bought and planned to take the rest with me on the next trek. I would be pouring it into a much smaller light-weight container though. 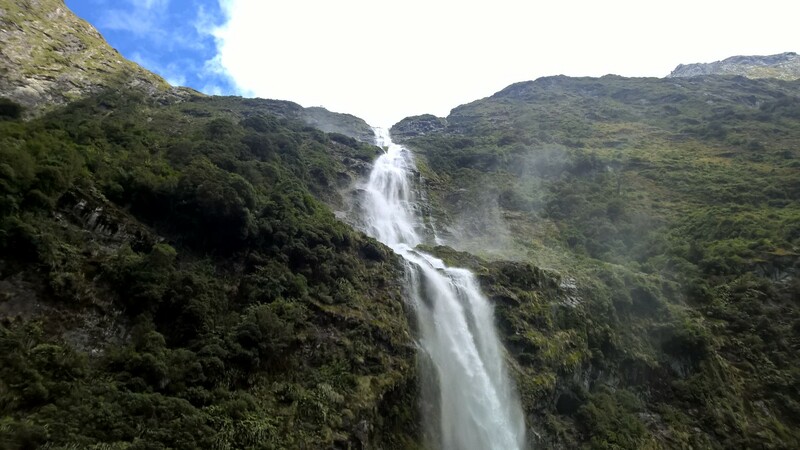 I’d been so jealous of the people on the Milford Trek who had taken wine and I thought I deserved it after all the hard work i had done over the past 2 weeks. 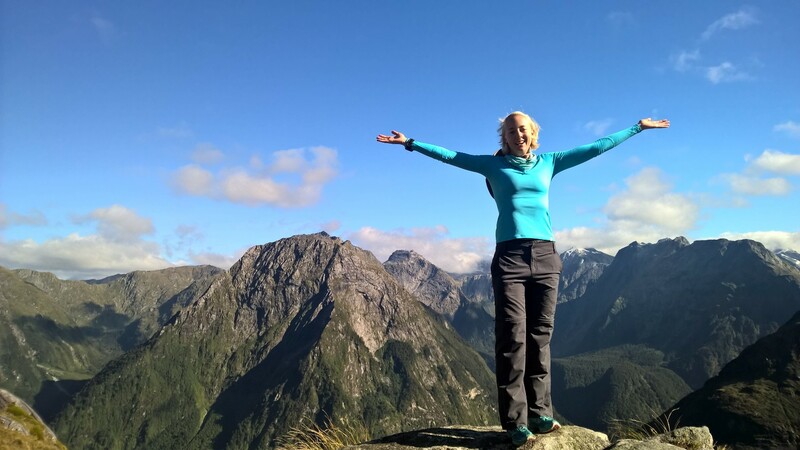 Finally I packed my gear and hit the hay, I was very thankful to have had such a wonderful, beautiful, amazing, breathtaking trip the past 4 days and was getting excited about my next adventure on the Routeburn Track. I dozed off to sleep as the sound of the man snoring in the room next to me carried through the walls…..